Please Note: Testing is included, but not mandatory for this course. No additional fees required for testing. **Please note that you only need to register once on the April 26th registration page. All cancelations must be received prior to the deadline. Refunds will not be given after the deadline date. Classes are not transferable. BOMA San Diego invites you to break out your drivers and dust off those bellbottoms for a groovin’ time at the 2019 “Bogey Nights” golf tournament. Join us on Friday, April 26 at Rancho Bernardo Inn for a memorable day on the green. Recently renovated, the 18-Hole San Diego Championship Golf Course at Rancho Bernardo Inn has hosted both PGA and LPGA events and continues to present golfers of all skill levels with a challenging and rewarding day on the course. -Please proceed to SESSIONS tab to purchase sponsor items. If you need assistance with registration, please contact Marisa Romero at marisa@bomasd.org. Premier Title Sponsor - $1,600 SOLD TO TRL SYSTEMS! Premier Tee Sponsor - $1,200 SOLD OUT! Regular Tee Sponsor - $1,000 SOLD OUT! Longest Drive Sponsor - $1,050 SOLD OUT! Closest to the Pin Sponsor - $1,050 SOLD OUT! Putting Contest Sponsor - $1,000 SOLD OUT! Brunch Sponsor - $2,000 SOLD OUT! Gift Bag Sponsor -SOLD OUT! Driving Range Sponsor - SOLD OUT! Raffle Donations?- Recognition at the reception. Please contact Shelby for more information. 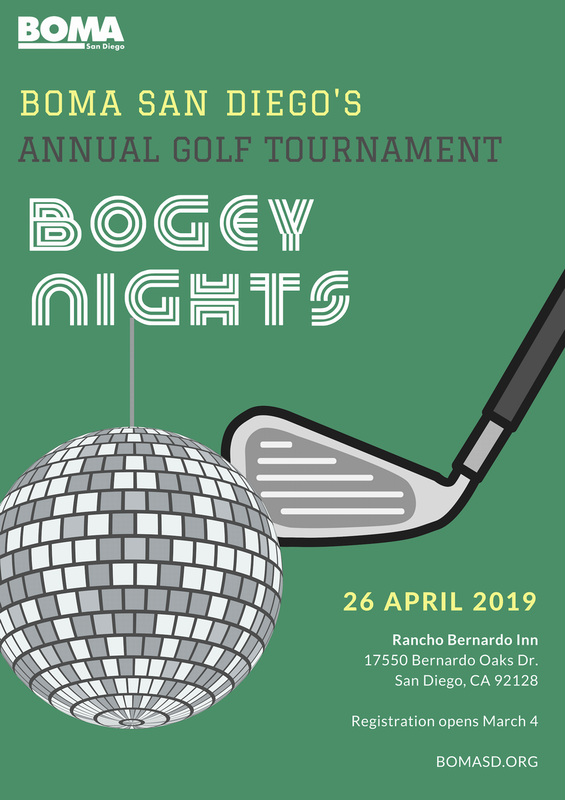 BOMA's Annual Golf Tournament "Bogey Nights "
BOMA San Diego invites you to break out your drivers and dust off those bellbottoms for a groovin’ time at the 2019 “Bogey Nights" golf tournament. Join us on Friday, April 26 at Rancho Bernardo Inn for a memorable day on the green. Recently renovated, the 18-Hole San Diego Championship Golf Course at Rancho Bernardo Inn has hosted both PGA and LPGA events and continues to present golfers of all skill levels with a challenging and rewarding day on the course. San Diego Building Owners and Managers Association, Inc.